I've been making wine on a small scale for over a decade, and since I started a number of people have told me stories of their Italian grandfathers making wine, and each shared with me of the same basic approach. Their grandfathers would make wine in a large vessel in the fall, leaving it in the same vessel through the winter, spring and following summer, drinking from it the whole time. This approach has obvious problems; there is too much air exposure which can oxidize the wine, and leaving it exposed can also allow an infection to set it, which can make it go off, taking on the flavor of vinegar for example. Several who shared with me these stories understood these shortcomings and had adopted more modern approaches. There are other wine making traditions that don't deserve to be maintained. For example, up until the 1970s several of Italy's antiquated appellations required blends of lesser white grapes with red grapes. Up until 1996 Chianti was an unfortunate victim of this traditional blending approach. The non-descript white grapes blended with Sangiovese did nothing for it. I'm told that many Chianti wines in the 1970s were quite bad; this blending requirement likely contributed to that. But there are many wine making traditions deserve to be maintained and certainly not all blends are bad. One such tradition with great merit involves blending two or more varieties at harvest. Generally wines are blended once they are finished. but you can blend grapes prior to fermentation. This type of blend is called a field blend, and fermenting varieties together like this is called cofermentaton. It's an approach that isn't as common as it once was, but it's still occasionally used. 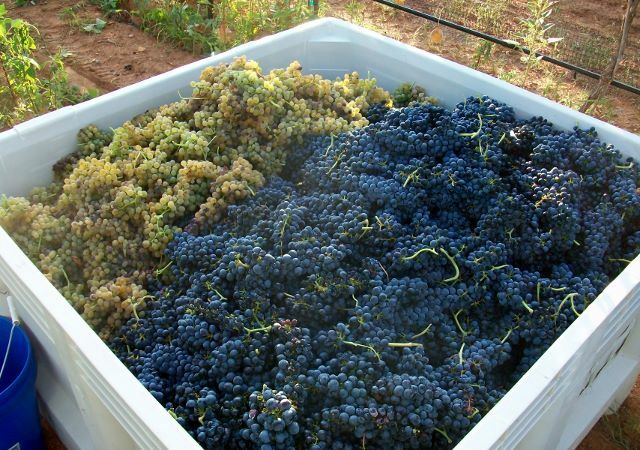 One common field blend involves the addition of a small amount of Viognier to Syrah. There are two reasons Viognier is added to Syrah; one is to improve flavor and aromatics that Syrah can often be lacking, and the other is to improve color. How Viognier might improve the flavor is easy to comprehend, but it seems counter intuitive to add a white grape to a red wine to improve the color. While this field blend was likely a chance discovery that was made long ago in the Rhone region in France, it's only recently been understood how a white grape might improve color like this. One explanation is that the polyphenols in the Viognier skins help "fix" or set the color, while another explanation suggests that the white juice, in the presence of the red skins, is able to extend the absorption of pigments throughout maceration. Whatever the exact reason, it's well established that a small addition of Viognier can greatly improve Syrah. Not only is this tradition still employed in France, it has also been firmly embraced by Australian makers of Shiraz (Syrah). Inspired by the great success with this practice by French and Australian wine makers I decided to give it a try. The 2016 Laramita Cellars Syrah includes 5% Viognier blended at harvest. The results are outstanding. The tannins are soft and velvety, and thanks to the Viognier the aromatics are exceptional. I think you'll enjoy it and I can't wait to share it with you.